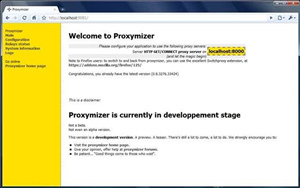 Proxymizer is distributed under the GNU Public License v2. IP to country database is provided by http://ip-to-country.webhosting.info/. It is released under its specific license (well, I guess it’s a specific one). Proxymizer uses and recommends the excellent Starksoft Proxy component for .NET, which can be found at http://starksoft.com/. Starksoft proxy component for .NET is released under BSD License. They are taken from Wikipedia, at http://en.wikipedia.org/wiki/ISO_3166-1. All of them are in public domain. Proxymizer lazy dudes also added the new Task Scheduler for .NET, at http://www.codeproject.com/KB/cs/tsnewlib.aspx. This library is released under The Code Project Open License (CPOL) 1.02. Of course, Proxymizer does not endorse any illegal activity. If you country laws say “don’t do it”, respect them, just don’t do it.